LET ME PAINT a picture for you that occurred a few weeks ago. My editor told me that my next assignment would be testing the snow for The Luxury Travel Bible as part of the Southern Hemisphere Ski articles. "Great," I said - you know that we will never turn down a travel experience. Oh wait, just one slight problem - I can't ski. "No problem," I'm told. "You can arrange beginners" lessons at Mount Perisher. And so I was off, ignoring the fact that I prefer ice to be surrounding Veuve Clicquot rather than underfoot and Louboutins strapped to my feet rather than planks of wood but a TLTB correspondent must do what a TLTB correspondent must do to bring you the luxury travel news. 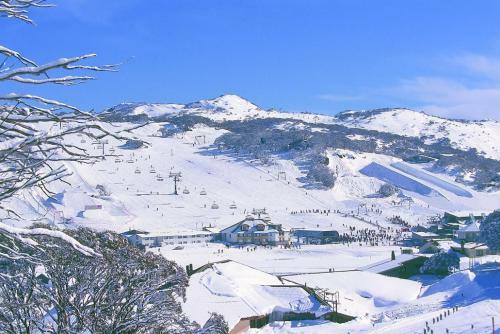 TLTB was heading to Mount Perisher - the largest ski field in the Southern Hemisphere - which is a five hour drive from Sydney, seven from Melbourne and two from the nation's capital Canberra. However, with the recent introduction of Aeropelican flights from Sydney direct to the Snowy Mountains the journey is reduced to a comfortable hour-long flight which allows for a lot more time en-piste. The night before the skiing lesson, while walking around Lake Crackenback resort, I was struck by the imposing snowy peak of the mountain and how amazing it seemed that there was this whole world up there that I had no idea of as yet. The following morning after donning the gear and feeling that I certainly looked the part we headed to the ski tube (all these terms would become clear to me as the day progressed) and the quick ride took us up to the top of the mountain. As we walked out of the station and were hit by the crisp air I felt more like a Junior Luxie than a well travelled correspondent. There was SNOW! Yes I knew skiing involved snow and while I have seen snow before (one of my best recent experiences was standing on the top of the Empire State Building when it began snowing) but this was not just a light dusting. This was a traditional Christmas card scene. My main concerns ... was that I would be in a class full of four-year-olds who would no doubt be better than me. But I digress, back to the matter in hand; the lesson. One of the main concerns for me was that I would be in a class full of four-year-olds who would no doubt be better than me and it would bring back dreadful sports class memories from TLTB's school days. After congregating at the designated point I was relieved to discover that my beginners' lesson featured only adults and all were in the same situation and all had the same goal - to learn how to stand up and gain a skill without breaking a body part. The ski instructors are all very friendly, encouraging and supportive. During the lesson we attempted to master going forward and stopping which is really all you need to know as a beginner. Unsurprisingly everyone was paying a lot of attention during the stopping instructions and were all very eager to get the hang of that as soon as possible. It really is quite unnerving to be standing listening to the instructor and find yourself slipping backwards down a slope. At the end of the two and a half hour lesson my class headed to the beginners' practice area to ride the moving train/magic carpet. The conveyer belt moves slowly and is a great way to take a moment to enjoy the view. At the top (with my confidence boosted after the successful lesson) I was hoping to attempt an actual run and give that complicated ski lift a go. And it really was going so well until I attempted to ski properly on the beginners slope. It started well. Once again I had that 'wind through my hair' feeling, until I realized how fast I was going and my brain started telling my body this was unnatural and out of my comfort zone. There was nothing else for it; I fell. I won't lie to you - it was not executed with the grace and style that you have come to expect from TLTB. Thankfully it was time for lunch and I met up with my group. One of the things that I was most impressed with was the shared camaraderie between skiers. The night before the skiers in our group were telling me lots about how much I would enjoy it. Now, they were also anxious to hear how I was going and whether I was enjoying it. Most importantly, they were eager to tell me that falling is to be expected (had they seen me taking my tumbles?). Perisher Village has a range of dining options to suit all tastes and time-frames including the on-slope pit-stop - although Mount Perisher is generally known for convience than fine dining. TLTB chose to eat at Jax Bar & Chargrill in Perisher Centre for a recharging pasta salad but the choice available is wide and means that every member of the group can be catered for and, best, there were no long lines or over crowded dining areas. After lunch we headed to nearby Blue Cow for a change of scenery which is only a short train ride away. The views here were amazing and had I not been so eager to master staying upright I could quite happy have parked myself with a hot chocolate and gazed at the backdrop all afternoon. Here it was a lot quieter and therefore far more beginner-friendly. A few more tumbles occurred throughout this session but then again the skier solidarity appeared when a couple came over to offer some advice. And so my first attempt at skiing was drawing to a close and I was trying to suppress the disappointing feeling that I did not get to attempt one of the runs. But when I told myself that at the beginning of the day I had not even known how to fix my boots into my skis I realized I had achieved something. Talking of ski boots a special mention must be made to Mel in the Mount Perisher hire centre. During my lesson it became clear that the boots I had rented were too small. The pinching of my toes was unimaginably painful. At the lunch break I headed straight to the hire centre and got re-sized by the ever-helpful Mel into ski boots as comfortable as Uggs. But I digress again, because now it was time to enjoy that après-ski lifestyle I had been hearing so much about. There is also plenty to do in the evening at Mount Perisher after a day on the slopes - from romantic candle-lit dinners to relaxed village bars to dancing in the nightclub (depending on how hard you worked your legs during the day, of course). Base 1720 Bar & Restaurant is one ski-in/ski-out meeting point, Snow Gums Restaurant's fine dining has views of Front Valley and The White Spider with its open fireplace and extensive menu has a relaxed atmosphere. As for me, I was heading back to Lake Crackenback Bar and Restaurant for a skiers' debrief over Wagyu and Wild Brumby schnapps. So, in answer to the big question; did I catch the skiing bug? Absolutely I did. In fact, expect to see me next Northern Hemisphere season hanging out with William and Harry at Klosters.